I love to try new things - even workout equipment ... So when I won these resistance bands - Gold's Gym Power Tone Plus - from a work Christmas party this past Christmas, I put them to good use. 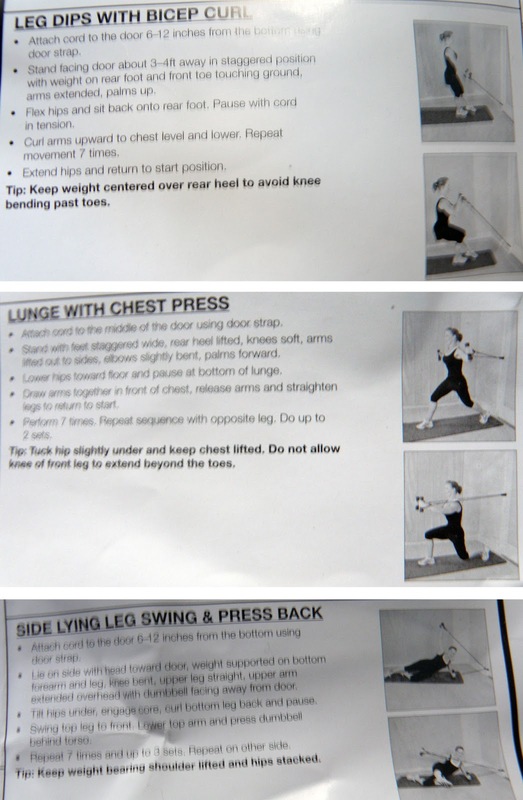 I had never used exercise bands before and wasn't even quit sure how to use them but was lucky that this set came with a workout plan with detailed written directions and pictures. The band includes a door strap which is how I use them most, though the door strap is not necessary to use all resistance bands. To use the band with the door strap, you attach the strap to virtually any door by opening the door, placing the door strap either over the top or down the side of the door and then close the door. The strap is firmly in place and your resistance band is threaded through the strap, ready for you to use. Variety: There are a number of resistance band choices on the market in a number of resistances, so you can find some to meet your needs. You can work your chest, arms, shoulders, back, legs and core with one piece of equipment. You can determine the difficulty level as well. Some bands come with a door strap or a strap can be purchased separately. You can use the bands with or without the strap. Convenient: The bands are portable and lightweight and can be stored anywhere - not a bad tool to take along when traveling either! Affordable: These bands only cost $16. The elasticity may weaken overtime requiring you to replace the bands, but I think the price is about right. I have found that I really like being able to incorporate this strength training workout into my week. This is a go-to workout for me when I am pressed for time or my energy level is lower and I don't feel like running or boxing. Once you are comfortable with the exercises and know how to use the bands, you can effectively work all of the muscles in your body without the need of dumbbells or other equipment.